B – Behind the scenes footage will get your customer’s attention and make them feel like they’re actually part of the experience; have fun with it! E – Excite followers by asking them to screenshot a snapchat you’ve posted to earn a discount, everyone loves a good saving! G – Get creative. Draw some fun designs on your snapchat! This could take some time but it never goes unnoticed by your followers, get creative and feel free to be silly! H -Help your followers by creating a snapchat only sale! Post the sale keyword on your story. This will help you earn more followers interested in participating in the sale and they will stick around! 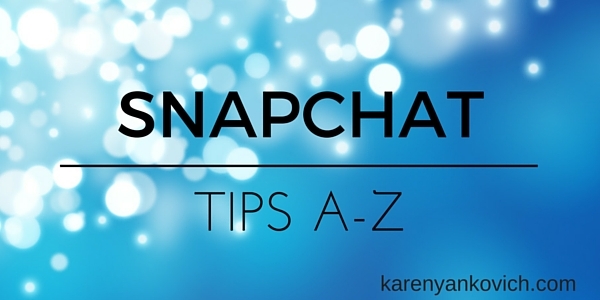 K – Keep it short and interesting, your snaps can be gone in a second. Make a lasting impression! N – Never create a story longer than a minute or two as it becomes tedious to tap through long stories. O – Organizations around the world utilize snapchat for their business. Follow them and see what they are going to keep their followers interested! P – Personalize your snaps to be about you and why you have passion about what you do. Engage your followers! Q – Questions engage your followers. Invite them to snap you back with their answers! This creates a personal relationship with your customers. R – Raw content can make followers feel like they are part of the behind the scenes work you put into your company. Post snapchats of things people would never get to see if they didn’t follow you! T – Talk about all the exciting things you have coming up in your week. Let followers know what they can be looking forward to by following you. U – Utilize the fun filters! Both the color filters and the fun face filters can be used to create fun snaps that will keep your followers interested in what you are posting. Have fun with it! X – XOXO, send your fellow business friends some love! Promote them and they will promote you right back! Y – Yell for all to hear! Let your snapchat presence known on all social media platforms. Z – Zero followers to millions, these tips will help you grow your snapchat platform! And remember, connect with ME! www.snapchat.com/add/karenyank I’m tweaking how I use snapchat all the time. As usual, if you have any questions about strategy, come join me in my LinkedIn group and let’s chat!